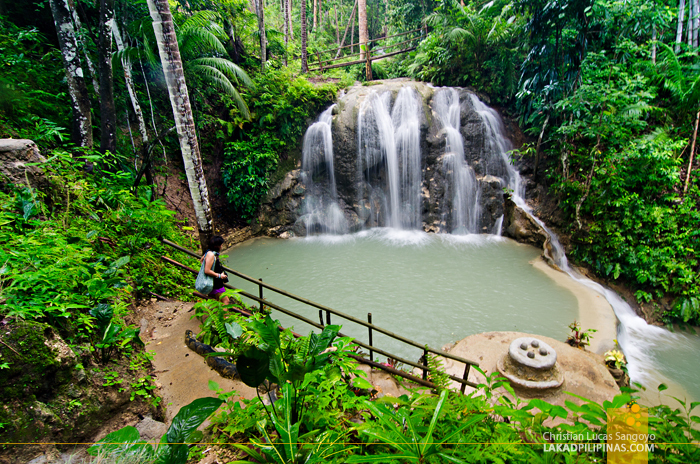 I wasn’t really aware that Siquijor has more than one waterfalls gushing down along its land. 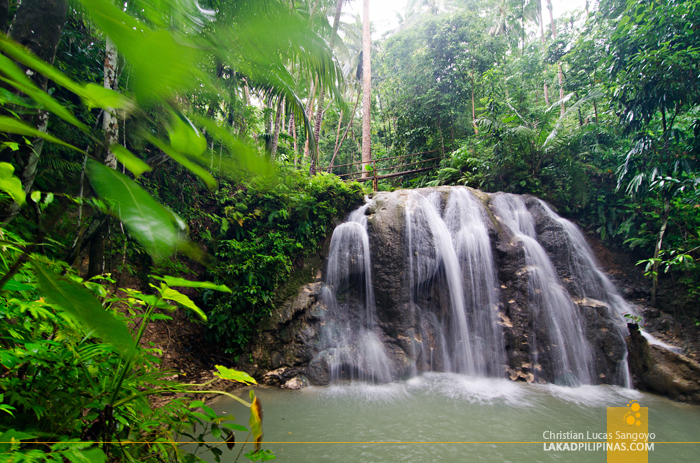 There’s the famous three-tiered Cambugahay Falls at the town of Lazi, and then there’s Lugnason Falls; a lesser known attraction located at Barangay Napo in San Juan. 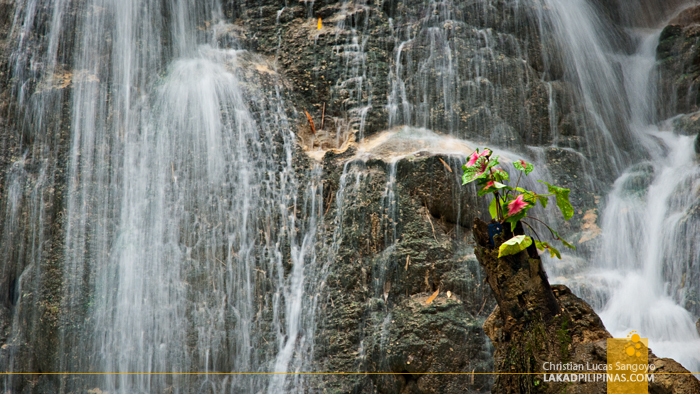 There are a couple of reasons why this particular waterfall is relatively unknown to tourists visiting Siquijor. First, I heard it closed down sometime ago due to its spring source drying up; we’ve been told by our guide that it has only been recently reopened. 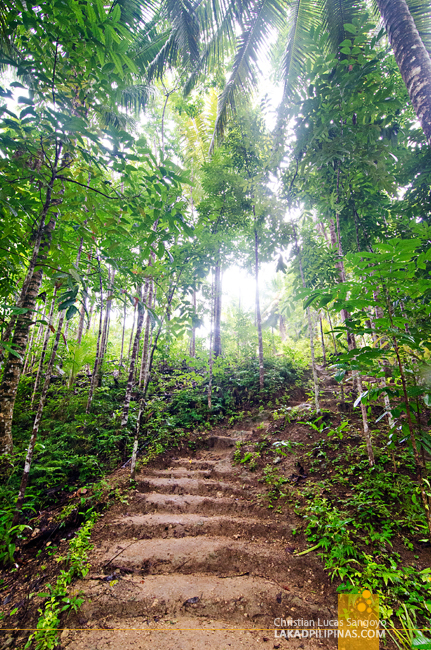 Second, the road leading to Lugnason Falls is more of a dirt track rather than a real one. Going up to the jump-off point is quite tasking to tricycles touring visitors around the island. I reckon most tour guides don’t really recommend this place to their guests. Third. To be quite honest, it really pales in comparison to Cambugahay Falls. Lugnason has none of that grandeur that Cambugahay exudes. 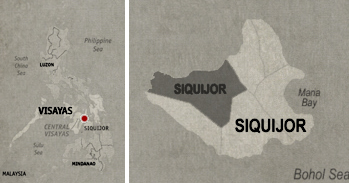 But none of these matters if you’re like us who’ve previously been to Siquijor. 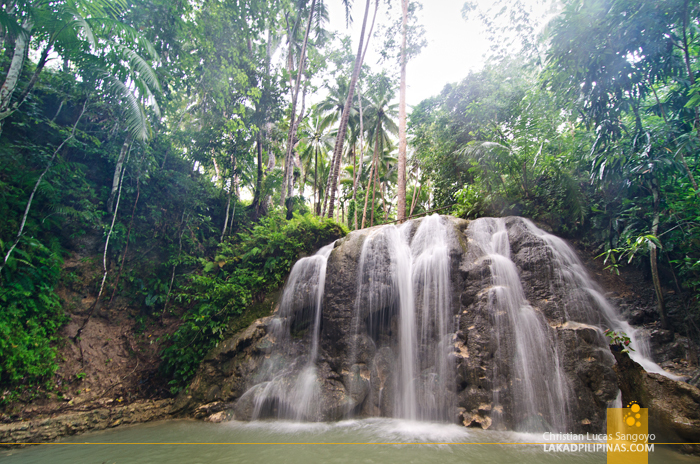 We, of course, wanted to see something new during our second time in the province, and Lugnason Falls fits our needs just fine. So one drizzly morning, we were fetched by Dennis, our guide through our three-day trip around town, at Siquijor’s Port Beach and off we went putt-putting to the uphill rough road to Lugnason. At the jump-off, we paid the requisite guide fee before descending on a slippery mud trail to the falls. It wasn’t really much of a hike, in five minutes, we were at the entrance to Lugnasan, snapping our cameras and looking on with a bit of disappointment; it really was no Cambugahay. 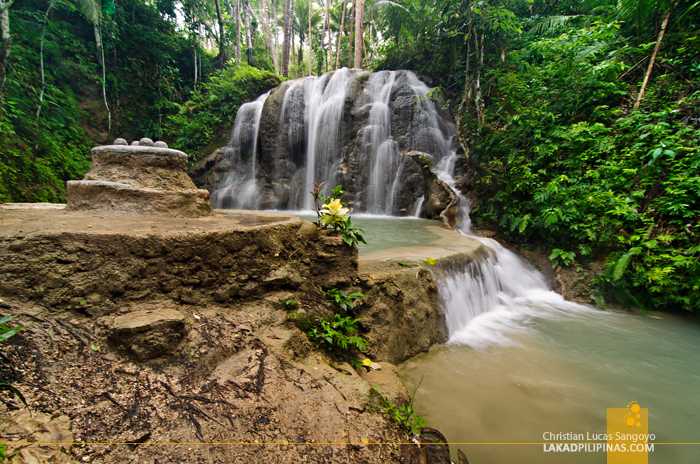 By my estimate, Lugnason Waterfalls rises to a squat height of 18 feet and is composed of lumpy chunks of malformed limestone rocks. Well, the good thing about it being unpopular was that we have the whole place to ourselves. 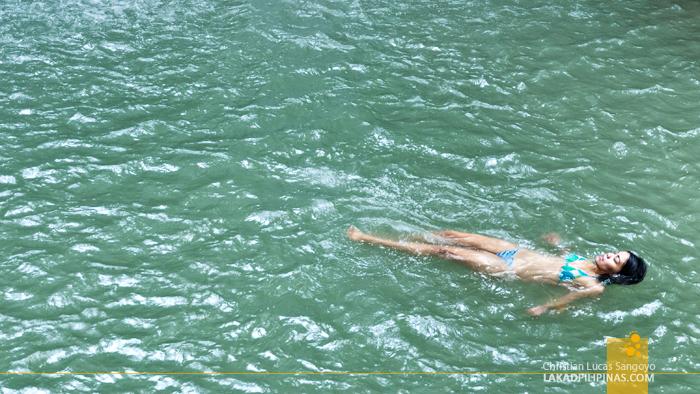 Stripping down, we jumped on its light blue-green waters, an effect when limestone mixes with H2O. The water basin is about 6 feet deep and very, very cold! I noticed that the run-off has been dammed by a concrete barrier to keep the water in, which I found it to be a bit of an eyesore, if I were to be asked. We saw a couple of benches and huts across the falls, I guess for picnickers in the area, but the weather was quite uncooperative at the time and we quickly left after swimming. I read somewhere that there are a series of smaller cascades about an hour’s rough hike from Lugnason, but I guess we’ll reserved that for next time. 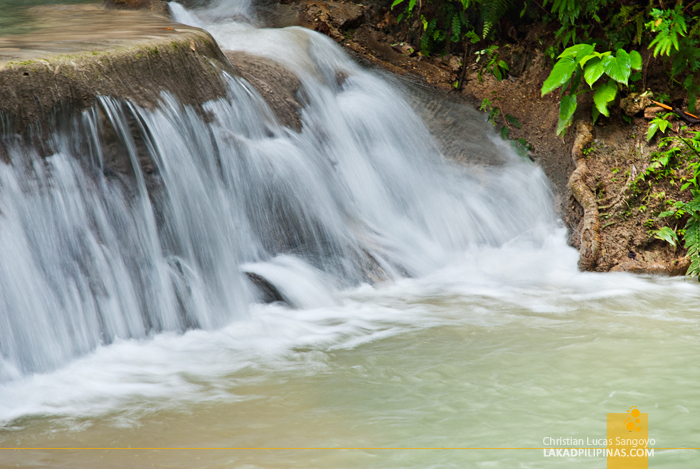 One new waterfalls at a time for us.